Brooklyn Women in the Arts might be a new venture, but they’ve got an impressive roster lined up for the day. On the music side, you’ll find It Was Romance, comedian and writer Lane Moore’s band who recently swept the press for their shot-by-shot remake of Fiona Apple’s signature and salacious music video for “Criminal,” made with Mo Fathelbab of the ever-scrappy The Experiment Comedy Gallery and set to the band’s song “Hooking Up With Girls” for a queer reimagining of Apple’s bad girl world. There’s the nicely-named “grunge-gaze” three-piece Baby Acid and an all-female punk rock trio Thundera. Then there’s the “Wednesday Addams of her genre” Hailey Wojcik, who stop-motion animates many of her own music videos, and mysteriosa “gypsy witch rock” force Espejismo, among others. If you’re tired of tunes, there will be comedy by Margaux With An X, who has hosted a comedy show at at Bitcoin Center (surprisingly, not a joke in itself) and Jesse Roth, who hosts a show at The Experiment (so it’s bound to be weird) and has studied at UCB. Rounding off the bunch is LeLe aka Hairy Guppy, an artist who recently participated in pop-up group show Barbie Does Puberty, where she presented her own fucked-up take on what could conceivably be Barbie’s experience of puberty. She’ll be concocting a dreamy (or nightmarish, depending on what you’re in to) art installation that will probably involve glitter, doll heads, plastic toys, iconography of the Virgin Mary, but maybe something entirely different altogether. So, sidle up to Sunnyvale, order up one of their “I Am The Liquor” cocktails (described only with a shrug emoji but purportedly equivalent to two-and-a-half of those lame “regular” drinks the rest of you basic bars are slangin’), and prepare your eyes to be assailed by the sweet, sweet view of No White Men Performing At All. However, the organizers stress that the event is not just for women, and everyone is welcome, no matter who you are. Just please, for the love of god, don’t mansplain anyone during their set. 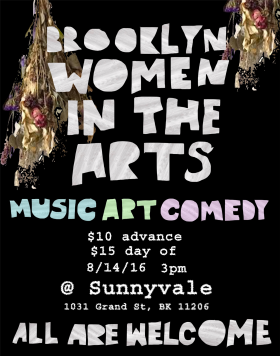 Brooklyn Women in the Arts Launch Show is happening Sunday, August 14 , 3 pm at Sunnyvale in East Williamsburg: $10 advance, $15 doors.